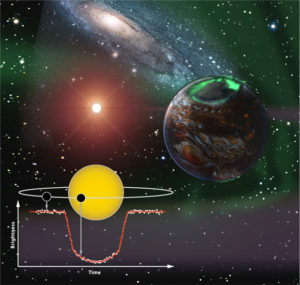 Our group conducts research in planetary astronomy, involving astrophysical models of planetary evolution and analysis of data from NASA space missions. The work focuses on extrasolar planets, planets beyond our solar system, but we also conduct research on planets in our own solar system. You can read descriptions of recent research projects on the research page. This page describes how to participate in the group. Our research group meets most Friday afternoons, 4pm during fall semester and 4:30pm during spring semester, in room 408 in the Multi-Purpose Classroom Building. The meetings usually last about an hour. These meetings are open to anyone, and we’ve had students from local middle and high schools attend in the past, as well as other members of the public. 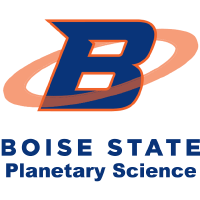 You don’t have to be a Boise State student or even a physics major to attend, and you don’t have to make any commitment just to attend meetings. You’re welcome to attend casually. We usually discuss research projects currently running in the group, as well as recent astronomical discoveries in the news. You can see recent topics of discussion here. If you’d like to be included on the weekly e-mail list for the research group, e-mail me. I regularly take on students for research projects. You don’t *have* to be a physics major to work with me, but I have limited time to work with students and so I have to give preference to physics majors. If there is grant funding for a project, I can usually pay a student for their work, and students are often invited to attend major professional conferences as well. Attend research group meetings regularly for at least one semester. Contact me to set up a one-on-one meeting to discuss research projects. Completing these tasks is no guarantee I will bring you onboard, but you don’t have to have lots of experience or have taken advanced physics classes to do research with me. Mostly, I need to see evidence of your commitment before I can commit to working with you. I will respect your time. I will strive to answer e-mails within 48 hours (except over the weekends or holidays) and provide specific, helpful responses. Depending on how well you follow through on a project, I will gladly write reference letters to accompany applications to jobs, summer research experiences, graduate school, and other programs. Although I expect consistent productivity, I realize your first obligation is to your schoolwork. Consequently, I will tailor my expectations to accommodate your academic obligations. My research group is intended to be a safe, welcoming space for students of all stripes. Discrimination and disrespect will not tolerated. Although there are sometimes funds to support student research, funding is NOT guaranteed and may be withdrawn at any time. I will be sure to give you notice before funding is ended, however. Stay in contact with me. If you encounter academic or life difficulties while you’re working for me, that’s OK. Just let me know, and we can adjust our plans. The absolute worst thing you can do is disappear without a trace. Bring a notebook to our meetings. No one’s memory is perfect, and you will forget things I ask you to do. So please take notes during our one-on-one meetings. After each one-on-one meeting, send me an e-mail summarizing the meeting. These e-mails are critical for me to keep track of what you’re doing. I also use these e-mails when writing reference letters – if you haven’t sent me these e-mails, odds are I won’t be able to write a very good reference letter. Attend group meetings regularly. I know you can’t always make it, and often class will interfere. But otherwise, I expect to see you at meetings most of the time (especially if I’m paying you). If, for any reason, you feel that our collaboration is not working out, please let me know. It is very common for students to switch advisors, and I will not take offense if you need to make a change. Neither of these lists is exhaustive, but I will be clear about other expectations. You can always e-mail me with questions.